Everyone needs a little color and beauty in their life. This is my very first posting on my new blog. My very good friend and fellow artist has been encouraging me to create a blog for some time now. It will be a place where I can share some of my experiences as well as my latest original paintings. I hope I can plant some seeds of creativity and inspiration as well as share my new work with you. 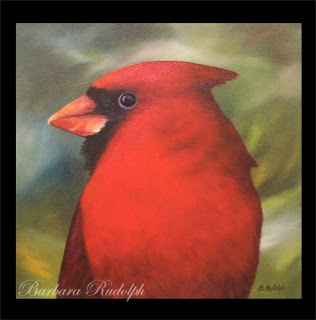 The Cardinal' Oil on wood panel 6x6"
Wow, this is so beautiful. You are so talented.